By 1912 the school roll had outgrown the shed near the railway station. The Education Board bought part of the Māori reserve and built the first classroom (now the right-hand end of the kindergarten building). It quickly became a social centre for Plimmerton. When, in 1912, the roll of the first school exceeded the space available in Mr Walker’s shed near the railway station, the Education Board agreed to a new school. The Board acquired part of the Māori land on the rise at the end of Steyne Avenue and built a single classroom; the room at the right-hand end of the current kindergarten building. 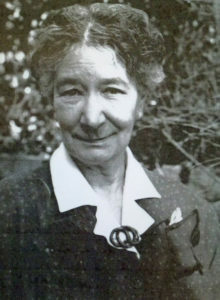 Miss Emily Irons was appointed sole charge teacher at the new school. As when attending the first school, the Paremata children continued to cross the railway bridge and walked through the sand dunes to Plimmerton until their train services improved. Their school was built in 1921. Pukerua Bay children caught the south bound train until their own school was built in 1927. There are stories of children walking down the valley to the top of the wetlands then along the railway line, which was an easier route than over Pukerua Road (now Airlie Road). 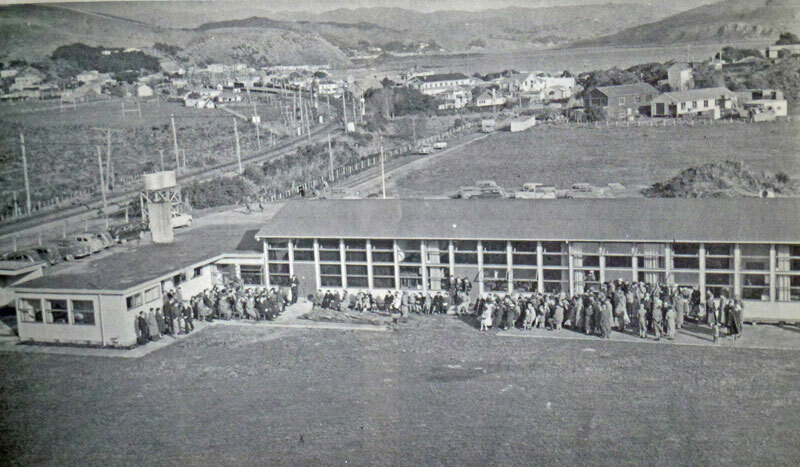 As Plimmerton had no churches or halls, the school room rapidly became the centre for all kinds of community gatherings. During the early years, the school committee ran fund raisers and worked hard to establish the school grounds. When it later became impossible to find members for the committee, Mr J Ames was appointed Commissioner. One of his legacies was the laying of the lower tennis court. This energy and enthusiasm paid off as Plimmerton pupils won the local tennis competitions for years to come. The school roll had reached 50 when Charles Dallaston became head teacher in 1919. A second teacher, Miss Jessie Rayne, had been appointed the year before. She used the old, unlined, ironclad building next to St Andrews Church for her classes. 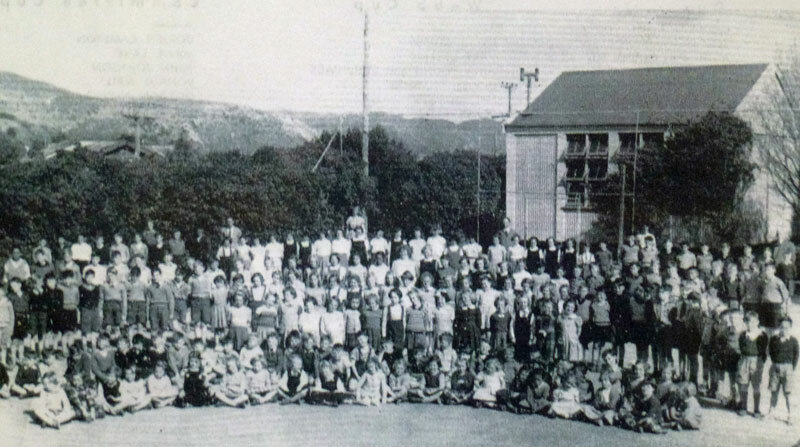 This had been Mrs Hanna’s school 20 years earlier (See Site 11 – Plimmerton First State School). Now this room was too small and the Education Board agreed to add a second classroom to the school building. The school roll continued to grow and everyone was working under ‘trying conditions’, with two and sometimes three teachers in the same room. Numbers justified a third classroom in 1925 when a new relocatable room was built at the seaward end of the tennis court. The roll fluctuated and 10 years later the extra classroom was no longer needed. It was taken to Paraparaumu School. There were enough girls for only one basketball team and the rugby team had to call on Pukerua Bay School to make up numbers. Children had moved to the new Paremata and Pukerua Bay schools and the Depression resulted in some families leaving the area. Also, in 1932 a new regulation was introduced stipulating that no child under 6 years could be enrolled. 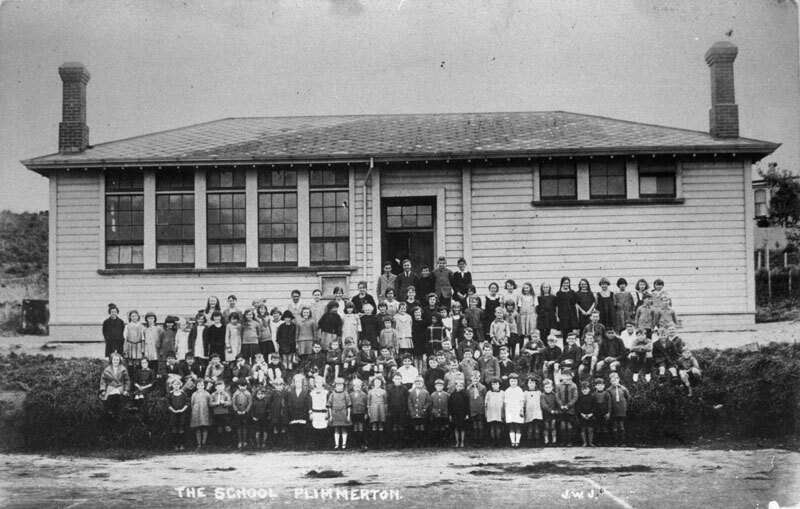 Plimmerton School and pupils about 1925. The building was extended to two classrooms in 1919. In the earlier years the school juggled its hours to suit train services from Pukerua Bay. For a while classes ran from 8.30 to 2.30 and later from 9.15 to 3.15. For a time Pukerua Bay children were taught between 8.30 to 2.30 and the others during the usual 9.00 to 3.00 slot. The school opened two weeks late in 1920 because the influenza epidemic continued to be a risk. It is said that during the school holidays the building was used as a hospital for Maori influenza patients. Before immunisation became available the school suffered other lengthy closures. In 1925 an epidemic of ‘infantile paralysis’ (polio) meant it did not open until mid-April. Efforts were made to provide the children with lessons at home. A big box was put on the school wall, and another one at Karehana Bay. Families collected their lessons each day, and no doubt dropped off their previous day’s work for marking. Mr Dallaston reported that the system worked well. Again, in December 1936, the school closed a few days early as polio had broken out in Otago. However, the Education Board did allow the school to have their already-organised Christmas Tree party on the tennis court. The school remained closed until the end of June 1937 except for a few weeks at the end of March and early April. Children took their books home and their lessons were published in the daily papers. A third polio epidemic occurred between December 1947 and late February causing yet another school closure. Interspersed with these disruptions, were outbreaks of mumps, measles, whooping cough, diphtheria and scarlet fever. We can certainly be thankful for modern preventative measures. The depression years were hard for many families but the community pulled together and supported each other. Six relief workers were engaged at the school in July 1932 and remained there for four years. They levelled the hill behind the school, laid the second tennis court, and generally improved the school grounds. The Education Board supplied them with tools such as pick, shovel and wheelbarrow which had to be returned on completion of the work. Between the two wars the area developed quickly. The most significant improvement was the construction of the new Paremata road bridge. For more than 25 years the community and its leaders had lobbied hard to persuade the Government to bridge the Inlet. When it was opened in October 1936 some 2000-3000 people came to celebrate. About 60 Plimmerton school children walked down to the site with their flags waving. After the speeches they joined other school children for refreshments and a programme of sports. When Prime Minister, Hon Michael Joseph Savage, died in March 1940, the school was closed for two days as a mark of respect. Three months later the annual King’s Birthday holiday was cancelled owing to the ‘exigencies of the war’. The school collected non-ferrous metals, rubber and textiles for the war effort. Children knitted many garments and sent parcels to former pupils on active service. Three girls were award special prizes for their ‘industry in knitting for patriotic purposes’. Leaflets were distributed on safety during ‘blackouts’ and the children practised rapid evacuation. 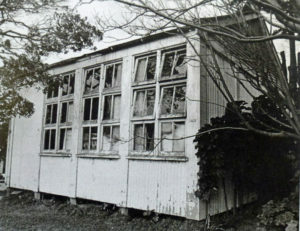 The “old tin shed” as the relocatable classroom was known when the Mana Little Theatre began using it as a studio in 1959. 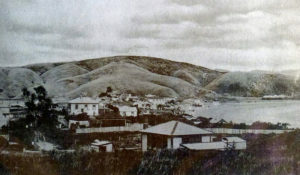 Given that Porirua Harbour was considered a potential landing spot for an invading force, extra planning and provisioning was necessary for Plimmerton. The relocatable classroom became a base for the Emergency Precautions Scheme. Stretchers and first aid equipment was stored there. The school was given firefighting equipment. Metal identification discs (2 pence) and leather labels (3 pence) were sold to the children. Trenches were dug along the side of the swamp on the new school site below Motuhara Road. These were partly ‘roofed in’ for protection from rain and freedom from aerial observation, and provided an evacuation point for the children. Fibre for rope making was in short supply and the Education Board considered harvesting the flax on the school site. The school committee agreed, so long as sufficient flax remained to screen the evacuation trenches. 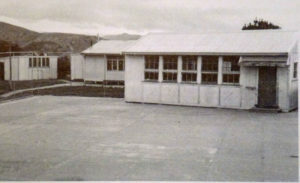 After the war the school grew rapidly and late in 1946 the Board agreed to provide a disused military building from Dolly Varden (Ngāti Toa Domain) to be put on the top tennis court and divided it into two classrooms. A shortage of lining materials delayed the upgrading process for quite some months. The Education Board had long known that the school would eventually need a larger site. Fifteen years of debate and negotiation ensued before the Education Board bought the site of the current school. With the Depression, WWII and the need to drain the swampy site, it was not until 1955 that this third school was ready for occupation. In the meantime more relocatable classrooms appeared on the upper tennis court. In May 1955 the school moved with more than 200 pupils to its new site in the aptly named School Road. The Minister of Education, Mr R M Algie, addressed the official opening and Mr J J Maher, MP for Otaki, presented the school with the complete set of Sir Winston Churchill’s war memoirs. Six foundation pupils from 51 years before attended the function.